1) Law of conservation of mass:- According to this law “matter can neither be created nor destroyed” Given by Antone Lovoisin in 1789. 3) Law of multiple proportion:- According to this law “if two elements combine to form more than one compound, the masses of one element that combine with a fixed mass of small whole number” given by Dalton in 1803. 4) Gay lussac’s law of gaseous volume:- According to this law “gases combine or are produced in chemical reactions they do so in a simple ratio by volume provided to all gases are at the same temperature and pressure” given by Gay Lussac’s in 1808. 5) Avogadro’s law:- According to this law “Equal volume of gases at same temperature & pressure should contain equal no. of molecules” given by Avogadro in 1811.
i. Matter consists of indivisible atoms. i. All the atoms of a element have identical properties (same properties) i.e. atoms of a element have same mass while atoms of different elements have different masses. ii.Compounds formed when atoms of different elements combine in fixed ratio. iii Chemical reactions involve reorganization (rearrangement) of atoms. Atomic mass unit = 1/12th mass of one carbon12 atom. Molecular mass = It is the sum of atomic masses of the elements present in a molecule. Mole :- It is the amount of substance equal to Avogadro no. 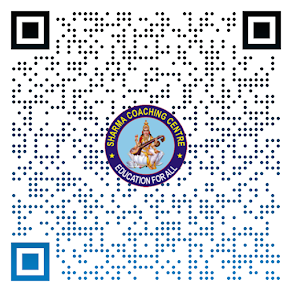 (NA). = 6.022 ´ 1023 atoms/mole. Molar mass:- Mass of one mol of a substances in gram is known as molar mass. Mass % of an element = mass of that element in compound ´ 100/ molar mass of the compound. Empirical formula :- It is the simplest whole no. ratio of various atoms present in a compound. Molecular formula:- It is the exact no. of different types of atoms present in a molecule of a compound. ii. 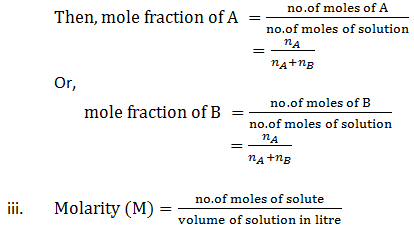 Mole fraction :- If a substance ‘A’ is dissolved in ‘B’ and their no. of moles are nA and nB respectively.